June 13, 2018 ended an era as Northwestern High School closed its doors. At the graduation ceremony, students (both Northwestern High School and Southwestern Classical Academy) crossed the stage in their caps and gowns to receive diplomas there for the final time. For 223 grads, it was a bittersweet ending, as their parents and grandparents had also attended the school. The building will now house the district’s alternative education program. 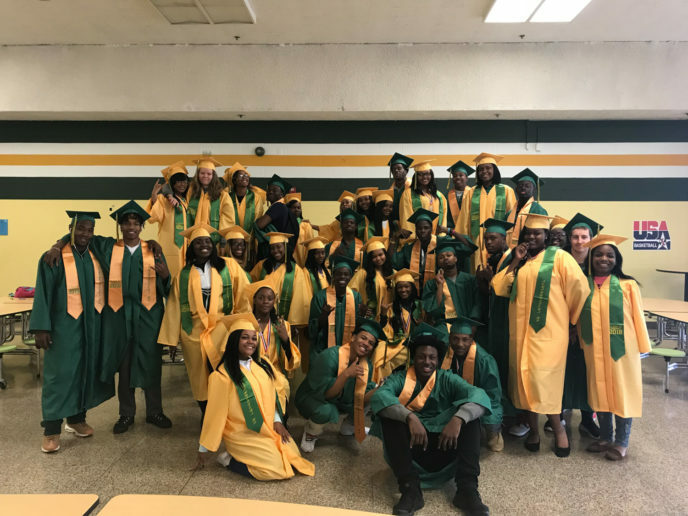 For the 2018/19 school year, Northwestern students will attend Flint Southwestern Classical Academy, the only remaining high school in Flint Community Schools. Northwestern High School opened its doors in September 1964. After initial construction, the school was dedicated to the Flint Community Schools Board of Education by Claude E. Stout. Further additions included a swimming pool in November 1964, and the Guy V. Houston football stadium in the fall of 1967. In 1999, Flint Community Schools entered into a contract with Edison Learning, Inc. (formerly known as Edison School, Inc.), the country’s leading private manager of public schools, in order to improve the school and boost student performance. Flint Northwestern became an Edison Learning partnership school, and its official name became Flint Northwestern-Edison Community High School. 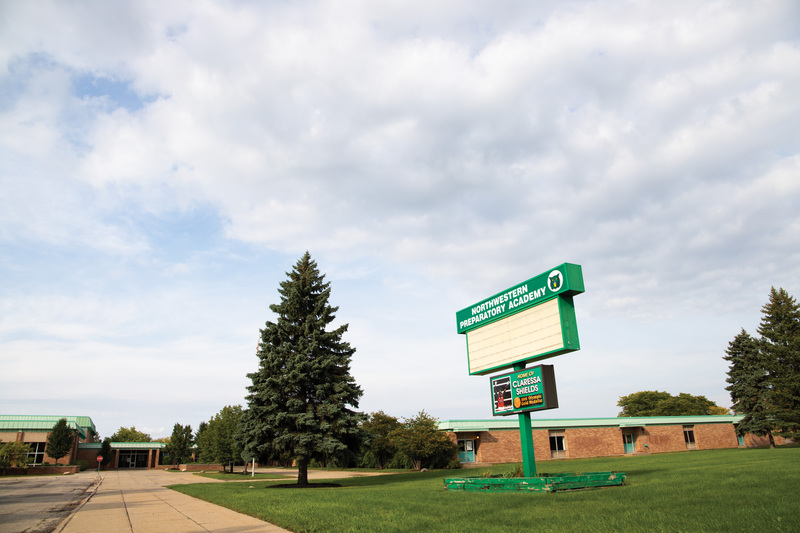 The contract was not renewed and in 1995, Flint Community Schools gave the institution its most recent name: Flint Northwestern Preparatory Academy. The high school’s official mascot was the Wildcat, and official school colors were green and white. My City Magazine did a little research in the Sloan Museum archives and found some interesting stories about Northwestern High School. Here is what we found. In May 1962, Flint residents voted in favor of a tax levy to build a new high school. The official tally showed 13,074 of the city’s 85,047 registered voters went to the polls. As a result, a 2.5 mil tax was levied for one year to provide nearly half of the $4.5 million cost of a fourth Flint public high school. The school was to be built on a 50-acre site the Board of Education owned on the north side of W. Carpenter Road, between Dupont Street and Clio Road. Plans were to have the school ready for use in early 1964. It was reported the school was badly needed to relieve overcrowding at Central, Northern and Southwestern high schools. The new facility was to be named Northwestern High School and similar to Southwestern High School, was expected to house 1,850 students. In a May 1986 Flint Journal archived feature, it was reported that times were tense at NHS over the last decade, the era of the Civil Rights Movement. Fights, many racially motivated, were frequent. Because of this period in its history, Northwestern established a reputation of being the worst school in the city. Northwestern gradually changed from an almost equal racial balance to one in which about 96 percent of its nearly 1,800 students were black. The changing racial balance in the school reflected the rapid transformation in the surrounding neighborhood from heavily white to mostly black. Principal Billye G. Thompson was reported as saying, “My best report is everything’s fine here and we’re doing good things. People make up their mind that this is a bad situation and they won’t hear differently.” It was also reported that the Achilles’ heel of Northwestern was that it was considered a “school for jocks, not scholars.” And while the school was proud of its prowess on the field and floor, Thompson said the district’s math and science magnet for the health professions was making headway in academics, as well. In the early 1960s, Flint schools stopped having homecoming celebrations, after it was reportedly deemed racially divisive. The city’s other schools had since reinstated homecoming events. In 1994, a group of Northwestern juniors approached school officials and asked that homecoming be reinstated at their school, and they got approval to do so. Students who attended the homecoming football game that year between Northwestern and Bay City Western High School said the homecoming was a morale-boosting event that was long overdue. Yolanka Barton and Morris Peterson, who were crowned homecoming queen and king, were treated like royalty with a crowd of approximately 300 people clapping and cheering. “I’ll do my best to uphold the credit of being homecoming queen of Northwestern,” Barton said. “It makes me feel special to have the opportunity to be the first homecoming king,” said Peterson. In May of this year, NHS gained national attention when National Geographic magazine ran a story written by Jiquanda Johnson and Lindsay Smith about the school’s last prom. “Prom in Flint is more than just a dance. It’s a celebration of triumph and survival – and this year was Northwestern High School’s grand finale. “The event marks a moment more significant than the dance itself. It’s an affirmation that these students have made it through the many challenges they faced growing up in Flint. Kelvin Trent Tucker graduated from Northwestern in 1978. He is a retired professional basketball player who played 11 seasons in the NBA. A 6’ 5” shooting guard, Tucker attended the University of Minnesota from 1978 to 1982, leading them to a Big Ten Conference championship in his senior year. He became the New York Knick’s top selection in the NBA draft. A 1984 graduate, Grayer is a retired basketball player. The 6’ 5” 200-pound shooting guard starred at Iowa State University from 1985 to 1988, where he set the all-time career scoring record with 2,502 points. In 1988, he was named three-time all-Big Eight and All-American, and was also chosen in the NBA draft first round by the Milwaukee Bucks. Graduating from Northwestern in 1985, Rice was one of the greatest scorers in college basketball history, leading Michigan to the NCAA title in 1989. Two months later, the Miami Heat made Rice their No. 1 pick (fourth overall) in the 1989 NBA draft. Rice was a three-time NBA All-Star, and made 1,559 three-point field goals during his 15-year career. Rice won both an NCAA championship and NBA championship during his collegiate and professional careers. Also graduating in 1985, Rison was a star football player at Michigan State University. Rison played professionally for the NFL’s Indianapolis Colts, Atlanta Falcons, Cleveland Browns, Jacksonville Jaguars, Green Bay Packers, Kansas City Chiefs, Oakland Raiders, and the Canadian Football League’s Toronto Argonauts. He was selected to the Pro Bowl five times, and holds an NFL record for scoring a touchdown with seven teams. Some other noteworthy NHS athletes include: Dennis Johnson, Danny Evans, Barry Stevens, Mark Ingram and Anthony Pendleton. Fields had worked at Northwestern for five years, first as a teacher, academic engagement officer and then as principal. She saw a lot of things, both good and bad. The most difficult thing for her was dealing with the tragedy of losing four students to gun violence. “It was rough,” she admits.